Cyber Tech & Risk is proud to bring you a high-demand “Cyber Threat Intelligence” in RBC WaterPark Place Auditorium on March 21, 2019 (6 PM – 9 PM)! Bob Gordon is the Executive Director of the Canadian Cyber Threat Exchange (CCTX). The CCTX is Canada’s private sector organization for the sharing and analysis of cyber threat information, and enabling collaboration across all sectors. Most recently, Bob was a Director, Global Cyber Security at CGI. Prior to this, he enjoyed a long and successful career in the Federal Government, which included being the architect of Canada’s first Cyber Security Strategy. Bob has had a unique career in a number of Canada’s security, intelligence and law enforcement organizations: Public Safety Canada, Communications Security Establishment, Canadian Security Intelligence Service, and the Royal Canadian Mounted Police. He held senior executive positions, including at the Senior Assistant Deputy Minister level. John Hewie is National Security Officer with Microsoft Canada leading the company’s strategy in country to develop trust in Microsoft technology and services. In this role John is responsible for managing security programs with governments, threat intelligence sharing agreements, cloud compliance with Canadian regulatory and legislative requirements, internal CSO functions, coordination with local law enforcement, and engaging broadly with the security community to help build a safer digital environment for all Canadians. Other recent career highlights include her role as the second in charge of Intelligence Services, which includes both cyber and technological crime. She implemented the inaugural Computer Cyber Crime (C3) Section of the Toronto Police Service. This was a Service-wide initiative addressing social media, open source investigative techniques, training, technology procurement and cyber-related threats and opportunities. 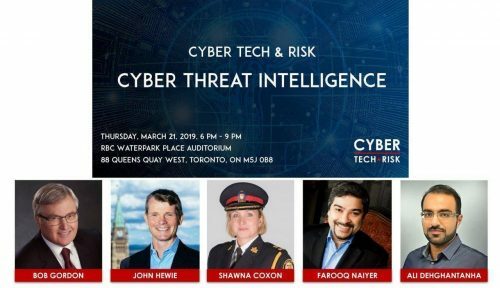 Farooq Naiyer is the CISO of the largest research and education network in Canada – ORION. He is the shared CISO of 5 Universities and 3 Colleges in Ontario. He provides strategic security thought leadership and brings tangible working programs and tools for compliance, risk management, a governance framework as well as delivery of broader shared security services. Farooq brings rich experience of more than 15 years in the area of cybersecurity, privacy, technology compliance and assurance. Prior to joining ORION, Farooq was part of the Cybersecurity and Privacy team at PwC in Canada where he led several cyber security engagements; he led IT Assurance teams for a leading retail giant in Canada; he also held leadership roles in leading financial institutions in the Middle East and South Asia. Dr. Ali Dehghantanha is the director of Cyber Science Lab in University of Guelph. His lab is focused on building AI-powered solutions to support cyber threat attribution, cyber threat hunting and digital forensics tasks. Ali has served for more than a decade in a variety of industrial and academic positions with leading players in Cyber-Security and Artificial Intelligence. Prior to joining UofG, he has served as a Sr. Lecturer in the University of Sheffield, UK and as an EU Marie-Curie International Incoming Fellow at the University of Salford, UK. He has PhD in Security in Computing and a number of professional certifications including CISSP and CISM.